At the height of the McCarthy era, an experimental theater troupe set up shop in a bar near the University of Chicago. Via word-of-mouth, astonished crowds packed the ad-hoc venue to see its unscripted, interactive, consciousness-raising style. From this unlikely seed grew the Second City, the massively influential comedy theater troupe, and its offshoots-the Groundlings, Upright Citizens Brigade, SNL, and a slew of others. Sam Wasson charts the meteoric rise of improv in this richly reported, scene-driven narrative that, like its subject, moves fast and digs deep. He shows us the chance meeting at a train station between Mike Nichols and Elaine May. We hang out at the after-hours bar Dan Aykroyd opened so that friends like John Belushi, Bill Murray, and Gilda Radner would always have a home. We go behind the scenes of landmark entertainments from The Graduate to Caddyshack, The Forty-Year Old Virgin to The Colbert Report. Along the way, we commune with a host of pioneers-Mike Nichols and Harold Ramis, Dustin Hoffman, Chevy Chase, Steve Carell, Amy Poehler, Alan Arkin, Tina Fey, Judd Apatow, and many more. 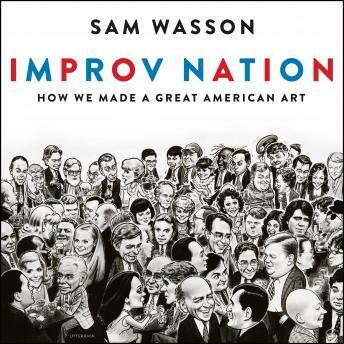 With signature verve and nuance, Wasson shows why improv deserves to be considered the great American art form of the last half-century-and the most influential one today. This book is amazing if you love Improv or Comedy, and like to hear the background to the stars and the form.